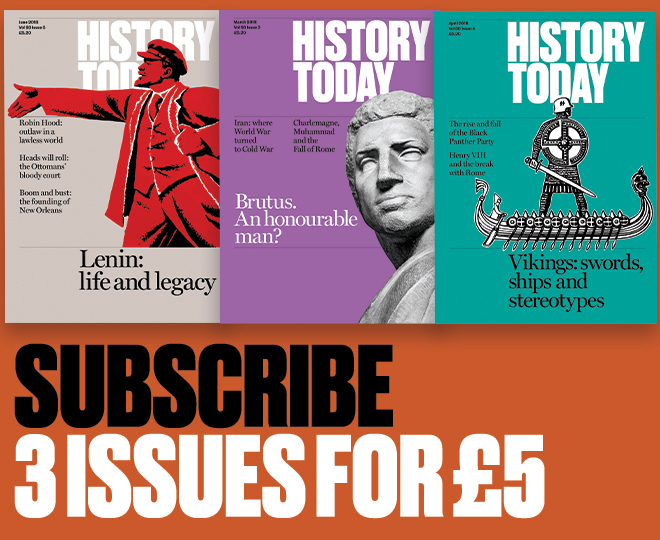 Roger Hudson details the rebuilding of the world’s first theme park in south London in 1853. The Crystal Palace rises again on Sydenham Hill, south of London, in 1853-4, one of a series of photographs taken by Philip Henry Delamotte. 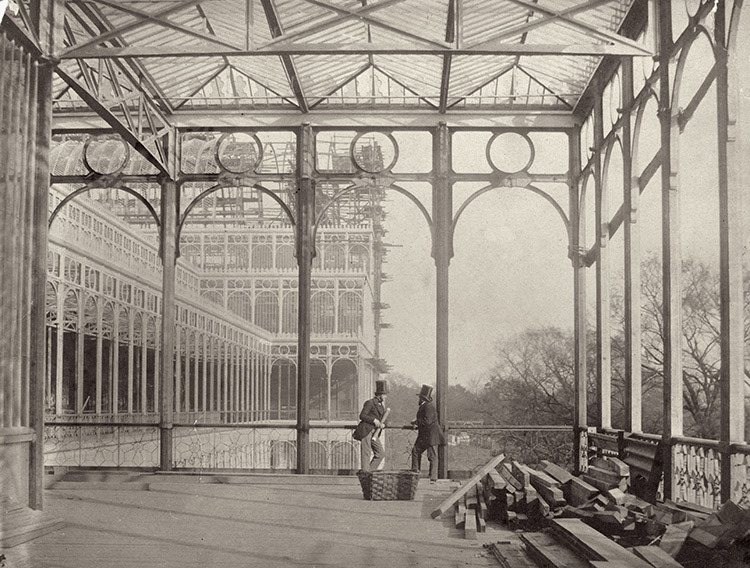 After housing the Great Exhibition of 1851 in Hyde Park the structure has been sold for £70,000 to the new Crystal Palace Company, which is employing 7,000 men to re-erect its identical, standardised cast-iron sections and create the surrounding gardens. They will then cover the sections once more in glass, using, as before, ‘glazing wagons’ whose wheels run along the gutters, carrying the glaziers, their tools and materials. The area in which the two stovepipe-hatted men stand is called the open colonnade, since it has a roof but no glass in the iron side-frames. The Palace cost £150,000 in 1851 but by the time work at Sydenham was complete, £1.3 million had been spent, some £800,000 over budget. It now had five rather than three floors and curved-roof transepts north and south to accompany the original central one, which itself had been added to avoid having to cut down three large Hyde Park elms, in response to a public outcry. Much of the extra expense was down to the elaborate gardens with their terracing and fountains (12,000 jets of water in all), statuary, maze and (inaccurate) life-size models of dinosaurs. There were also two 284-ft-high brick water towers designed by Brunel. Inside there was a concert hall, complete with vast organ, and Pugin’s original 1851 fine art Medieval Court was now joined by Egyptian, Greek, Roman, Pompeian, Moorish, Byzantine, Renaissance, Indian and Chinese ones, full of plaster casts of sculpture collected round the world by Owen Jones. The expensive grounds were the brainchild of the great gardener Sir Joseph Paxton, who had first come up with the idea for the Palace, based on the ‘Giant Stove’, the huge greenhouse that he had built for his employer, the 6th Duke of Devonshire, at Chatsworth in the 1840s. The ridge-and-furrow roofing system, which can be seen clearly at the top of the photograph and in the background forming the curved transept roof, was a particular invention of his but it never really caught on; it was not until the 20th century that the Palace came to be seen as a model of what could be done in the way of a functional, modular glass-and-metal structure. Predictably the architectural establishment at the time was jealous of him for his originality and his success. Once the thousands of workmen were finished at Sydenham, Paxton arranged for them to go out to the Crimea and build roads for the army besieging Sevastopol. Later he was very much the driving force behind the building of the Thames Embankment and the West-East sewer alongside it, when not designing country houses for the Rothschilds in England and France. The Company never really recovered from the overspending at Sydenham, although Londoners flocked for entertainment and relaxation via a specially built railway line to this, the first theme park. On Sundays, the one day when the working man might have come with his family, it was closed. It still had two million visitors a year, with concerts, rallies, mass meetings, and Brocks’ firework displays every Thursday. The Company finally went bankrupt in 1909 and the Palace was then bought for the nation, only to burn down in 1936.